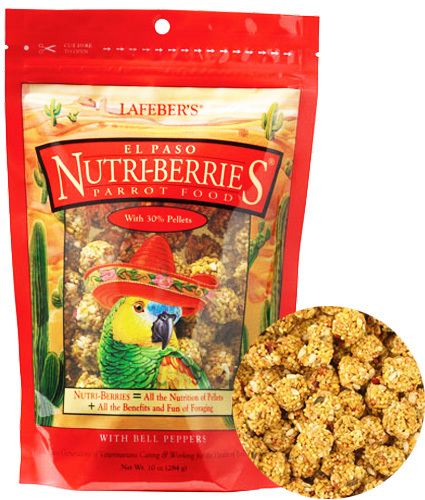 The ingredients in Lafeber Gourmet El Paso Nutri-Berries are generally whole, rather than being ground, this gives Nutri-Berries the taste and texture that parrot love. Nutri-Berries are made with hulled seeds and grains. Each berry is then coated with essential vitamins. The Tex-Mex hot and spicy flavor of El Paso Nutri-Berries comes from a combination of peppers, chili powder and other exotic spices. All Lafeber Nutri-Berries are all intended to appeal to a bird's keen eyesight and intuitive sense of play.